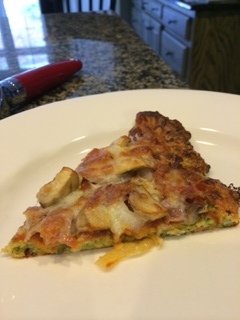 Today, we made a zucchini crust pizza. Because we are stuck in an ice storm, we were looking for a low-cal alternative to one of our favorite comfort foods! Preheat the oven to 550*F with a pizza stone already in the oven. In a large bowl, toss the zucchini with 1 teaspoon of salt and let sit for 15 minutes. Squeeze the excess moisture out of the zucchini in a paper towel — you might need a couple of them. Once all the moisture is gone, add the zucchini back to the large bowl and add the flour, eggs, cheese, basil, oregano, salt, and garlic. Using your hands, mix all of the ingredients together to form a “doughy” mixture. Place the zucchini mixture onto a piece of parchment paper. Spread the mixture out using your fingers until it is about 1/2″ thick. Once shaped, place the crust and the parchment paper on the pizza stone. (Don’t worry, the parchment paper will brown during cooking). Cook the pizza crust for 8 minutes. Once the crust starts to brown, take it out of the oven for toppings. Add whatever toppings you want! 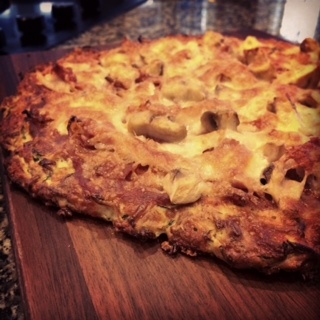 We added bacon, prosciutto, mushrooms, and onions. Place the pizza back into the oven and cook from an additional 4-5 minutes. Take out, cool, slice, and enjoy! This entry was posted in Uncategorized and tagged cooking, family, food, healthy, low calorie, recipes. Bookmark the permalink. Thanks! It was just as delicious as it looks! Yummy!! Will have to try when I can get to the grocery store as I have half of the ingredients. Maybe Friday?? Hopefully we will be able to get out of the house by Friday!